As soon as seedlings sprout, the seedling stage begins. Keep seedlings 4 inches under fluorescent light. Your light should be kept on 18 hours a day or more, and 24 hours a day will not hurt the seedlings. New seedlings need food right away, but are not used to anything yet. Just like newborns, they can't handle germs or strong foods very well. 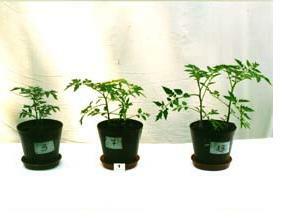 Also, nitrogen can damage very young plants. For ten days or so, plants usually like to be fed something high in phosphorus to jump start root growth. Whenever they need water in the first ten days, give them about 400 ppm of a fertalizer high in phosphorus (the middle number). I use Maxsea 3-20-20 for this without a problem. I also add Thrive Alive B1 at 10 ml/gallon to pump up plant vigor and really encourage those roots. The first week is most critical. Your seedlings should be kept at 72-75 degrees. If your air is dry you should keep the seedlings under a humidity dome. After that, a gentle breeze from an oscillating fan will help encourage stronger branch and stem growth. After the first ten days, you are probably ready for transplanting into 4 or 6 inch containers. This time the mix should contain 20 percent worm castings. You can now begin feeding the plants to encourage vegetative growth . A good place to start would be 500 ppm of Maxsea 16-16-16. For vegatative growth, you could use even more nitrogen than that (the first number). Remember, the worm castings are mostly nitrogen also. Most vegetables and herbs can be kept in this way until their seedling stage gives way to vigorous stem and leaf growth, known as the vegetative stage.